Rory McIlroy in action in France on Friday. 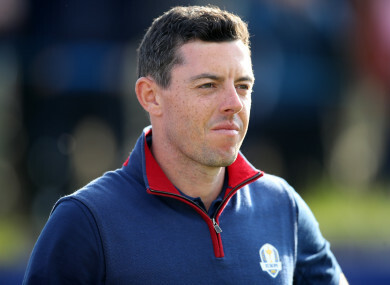 RORY MCILROY NEVER lost the confidence of Team Europe captain Thomas Bjorn despite a lacklustre showing in the opening session of the Ryder Cup. The four-time major winner partnered rookie Thorbjorn Olesen in Friday morning’s fourballs, the pair suffering a 4 and 2 loss to Dustin Johnson and Rickie Fowler. McIlroy was clearly off his game, yet skipper Bjorn stuck to his plan to play the Northern Irishman in the foursomes, teaming him up with Ian Poulter. It was a move that paid dividends, the duo triumphing 4 and 2 as the hosts stormed the session 4-0 to take a 5-3 lead after the first day’s play at Le Golf National. And Bjorn insists he never gave any thought to leaving McIlroy out, though he was given further cause for concern when Bubba Watson and Webb Simpson went two up. “I had a plan and I stuck to it for this first day, and I’ve had it for a few days. That’s how I saw the day. That’s how I saw the matches,” said the Dane. “You know, great players, when they don’t perform to the standards that they want to, they have an ability to just go and prove themselves. “They want to put it right, and he did. He did it in a match that they [McIlroy and Poulter] got good vibes off each other and did well on the golf course. “They got off to a bad start and they turned it around. “I never have any doubt in Rory McIlroy, because if I start doubting him, then I probably shouldn’t be doing this job. Tommy Fleetwood and Francesco Molinari were the catalysts for Europe’s revival, sealing their side’s first point in the final fourballs game before adding another in the foursomes. It came on Fleetwood’s son’s birthday, but Bjorn did not feel too guilty about taking the Englishman away from his family for the day to form one half of a formidable partnership. “I couldn’t promise Tommy that he was going to play two sessions, so there were a few different ways of doing it,” he said. “Now [he's going to] have a little bit of time with his family. “You’ve got a former French Open champion and The Open Champion. They just love playing [with] each other. Email “'I believe in him' - Bjorn never doubted McIlroy despite lacklustre start”. Feedback on “'I believe in him' - Bjorn never doubted McIlroy despite lacklustre start”.